Another interesting crypto currency exchange model can be found at localbitcoins.com. It is owned by LocalBitcoinsOy, a company based in Helsinki, Finland. What stands out when it comes to localbitcoins.com is there unique approach to market making. They developed the business in such a way that people all over the world can be able to exchange fiat money for bitcoin. They have support fo only one crypto currency and that is bitcoin. 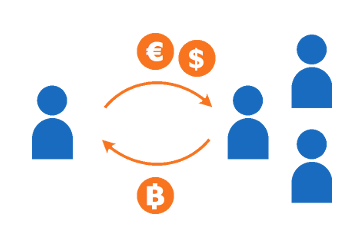 The localbitcoins.com exchange is built in such a way that connects people who want to sell fiat money for bitcoin, with those who want to sell bitcoin for fiat money. The website is like an advertising center, where people like yourself can post. You basically have to make a deposit and then set your own price. With the localbitcoins.com platform you can then find someone who is willing to accept your offer. In terms of fees, registering, buying and selling bitcoin is completely free. Users who create advertisements are charged with a 1% fee for every completed trade. All transactions to other wallets of localbitcoins.com users are also free. Speed is another detail localbitcoins.com take into account. A bitcoin transfer between localbitcoins.com wallets are being processed instantly. However, transactions take between 10 to 60 minutes when you send bitcoin to your localbitcoins.com wallet. LocalBitcoins.com is a market where people can exchange fiat money for bitcoin. The business is built in such a way that brings together people who want to buy bitcoin and people who want to sell. You also have a lot of deposit options to choose from and fees are relatively low. In terms of the negative aspects, only bitcoin is supported. Also, there is a 1% sell fee + since anyone can register free, there are some users that can be suspicious. Localbitcoins.com is an exchange for bitcoin where people can choose from a diversified offer. They qualify as a reliable bitcoin exchange. Summary: Another interesting crypto currency exchange model can be found at localbitcoins.com. It is owned by LocalBitcoinsOy, a company based in Helsinki, Finland. What stands out when it comes to localbitcoins.com is there unique approach to market making. They developed the business in such a way that people all over the world can be able to exchange fiat money for bitcoin. They have support fo only one crypto currency and that is bitcoin.